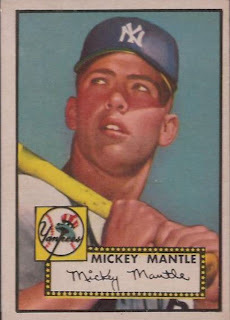 I thought it would be fun today to take a look at the three high number double prints Topps sold to the youth of America in the late summer of 1952. 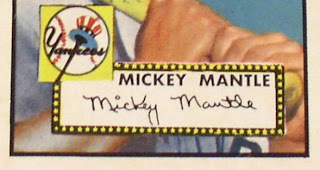 It's not well know but in addition to the oft-documented left pointing or right pointing stitching on the "baseballs" containing the card number on the backs, there are differences on the fronts of these as well. Sy Berger has confessed the high numbers were practically slapped together at the last minute and the evidence on the Mantle's certainly supports his statement. 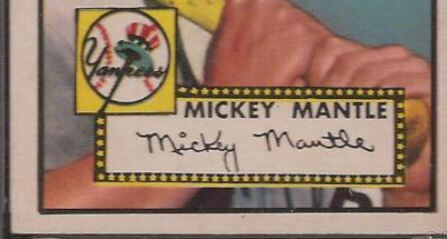 This is all just an exercise in observation as the back of the card has such an obvious variation in each instance but it shows part of the production process in 1952 and reveals just how madcap the rush was to get out the '52 highs. I managed to sneak a post in on some soccer stickers last time out instead of finishing my look at the 1952 Topps high numbers. So it goes on a lazy three day weekend.....plus I had a chance to think it out a little more. I found an interview with Sy Berger where he indicated the 1952 highs were definitely a last minute effort, which I think supports my theory they had pictures already in hand from the 1951 season for all the players to appear in the 1952 set. I also consider that the high numbers should have totaled 100 cards in number as all prior series were divisible by 10 when counting subjects. 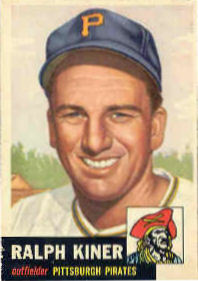 Well, Ralph Kiner fits the bill. 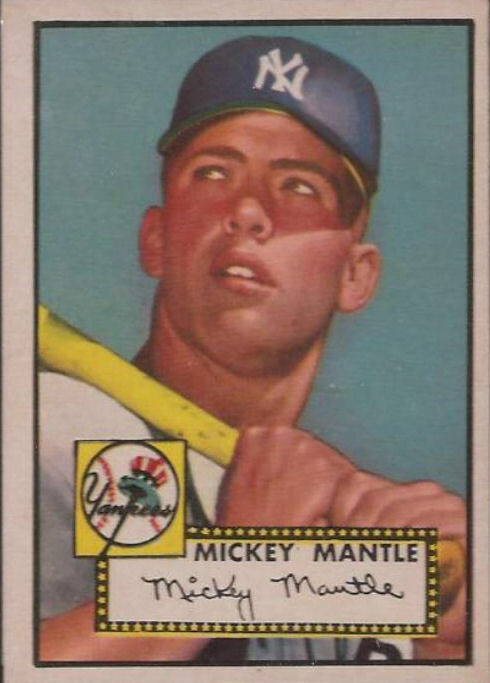 He was in two 1951 Topps sets (Major League All Stars and Red Backs) and in 1953 would appear on both a Topps and Bowman card, so he is a ripe candidate to my mind as he may not have been a Bowman exclusive. Hal Newhouser is also a good possibility. He did not have a great 1951 season but bounced back in 1952 and would certainly have been a guy with a mug shot or two lying around. 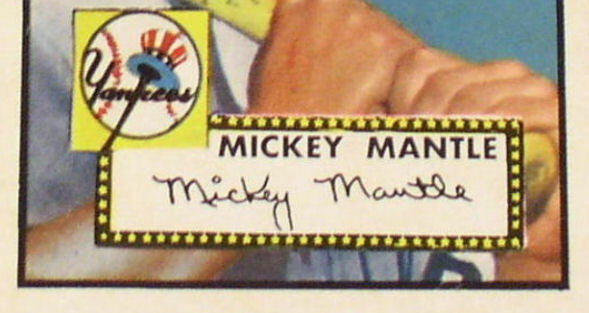 He never was on a Bowman card and was a well known name. Johnny Logan is another potential future garbage scow candidate. 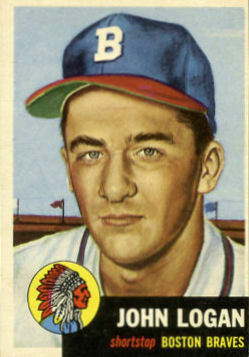 Logan had a decent 1951 rookie season for the Boston Braves and looks like he was on the roster all year so unless he missed picture day on any the Braves half dozen or so visits to New York City that year, he should have been a guy with a photo on file. He has a rookie card in the 1953 Topps set and in '54 was on both Topps and Bowman cards and given Bowman's propensity to only issue cards of proven players in 1952 (starters mostly) would have been a good choice for Topps as he does not seem like a Bowman exclusive. Now, if Bowman was not able to contest these three players, perhaps they were involved with some kind of local promotion that precluded their appearing in the 1952 Topps high numbers. I would think that more of a possibility with Kiner than the other two but who knows? Many thanks to Alan for providing this checklist. My Corel Paint Shop program is not letting me color in the double prints on the left edge of the left schematic but they are five columns over, hard on the border, in the same rows as the highlighted ones. I plan to look at the differences between the double prints shortly but today am contemplating which three players could have been pulled as it would seem highly probable that the set was to have been complete at 410 cards and not 407. Topps had won their initial legal skirmish in 1951 with Bowman over players selected for baseball cards after a less than stellar debut that year, as we all know. With the departure of Warren Bowman from his namesake company in the spring of 1951 Topps would have been empowered to go after Bowman full tilt in 1952 with their broad player selection and Giant Size cards. Bowman though, was not without their own legal beagles and may have had three players under contract that Topps had intended to include with the high numbers (or, more properly, second series as it was commonly referred to at the time) but were forced to pull. 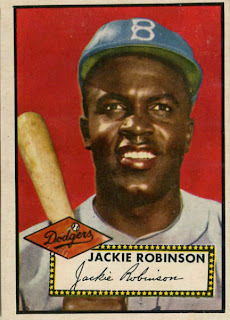 We can eliminate rookies who debuted in 1952 as there would not have been any photos available for Topps and players exclusive to Bowman at the time (big stars usually). So who then? One thought that occurs to me is that one player apiece from the hometown teams were originally slated to appear in the slots duplicated on the sheet. The nameplates used on the three DP's seem even more slapdash than the ones on the non-DP cards and while I am assuming they would have had the team logos already in place, it's an educated assumption. The question then is, which players were pulled? A couple of obvious candidates, Carl Furillo and Casey Stengel were Bowman exclusives until Topps bought their main competitor in 1956 so they are out, as is Sal Maglie for the same reason. Vic Raschi? Bowman all the way. OK, time to narrow things down starting with the Yankees. Whitey Ford seems like a good candidate as he was in the '51 Bowman set, then nowhere at all in '52 before resurfacing with Topps in '53. If there was no Topps or Bowman card for Ford in 1952 then he seems like a player whose contract was either being litigated. However, he was in the military during the 1951 and 1952 seasons so he's probably not our missing Bronx Bomber. Topps stretched their player rosters but not for a guy who had missed the year prior and was slated to be out in '52, although there is precedent as Joe Page did not pitch at all in 1951 (or '52 for that matter). So we look to the season roster. A few guys are not on any '52 cards; Jim McDonald, Jim Brideweser and Bob Cerv all saw limited action with the Yanks in '52, with Cerv leading the way with 12 games played. 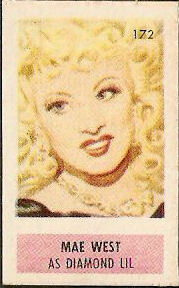 But Cerv's rookie card is in 1953 (Topps) so he's probably not our guy, the others only played a couple of games. Charlie Keller looked promising but he was released by the Tigers very late in 1951 and the Yankees did not pick him up again until September 1952, so it's not ol' King Kong. That pretty much leaves us with Art Schallock, who debuted in July of 1951 and had a solid half year on the mound for the Yanks. 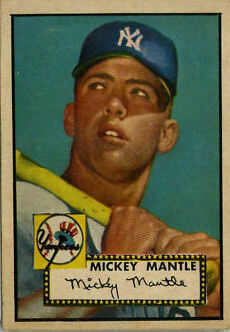 The Dodgers, after you eliminate Furillo (who was the only Dodger in '52 to be a Bowman exclusive from what I can see, with the possible exception of Don Newcombe) and all the rookies who debuted that year, had two guys (Joe Landrum and Steve Lembo) who did not play in '51 but debuted in 1950 and had their last season in 1952. 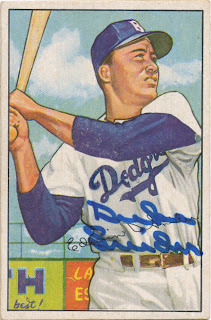 They are certainly possibilities as was Don Newcombe, who appeared with Bowman commencing in 1950 then was theirs exclusively excluding his absence in 1953 due to military service but could have been a ripe candidate to be poached. Still, he feels like a Bowman exclusive when you look at it a little. Nobody else who played for Brooklyn in 1952 fits the bill and Topps had already included four coaches, three guys who did not play at all for the Bums in '52 and another player who was in the military to stretch things out so it could have been either Lembo or Landrum. I am going to go with Landrum, based upon his stellar prep career and despite the fact he served in the military for 1951, as Lembo was sent down for the 1952 season, playing in Fort Worth. If you click the Landrum link above, you will see the guy was considered a stud in '52. As for our missing Giant, again after eliminating the rookies we have some candidates. 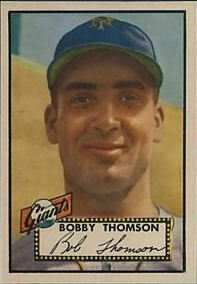 The one guy who I am sure Topps would have loved to depict on cardboard, Roger Bowman did not get a card at all until 1955 when he appeared on his namesake brand, so I say no to him. 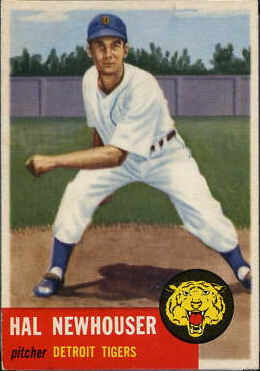 George Bamberger pitched two really lousy games at the end of his rookie season in 1951 so no to him too. Ray Noble is a possibility as the catcher had a solid rookie season in '51 and was in the '51 Bowman set and '52 Berk-Ross set (Berk-Ross is a dark horse for contract exclusivity). After that, there's really nobody so I will go with Noble. So were Art Schallock (#408), Joe Landrum (#409) and Ray Noble (#410) the three missing players? 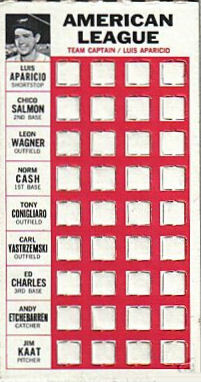 For Topps, those were exactly the types of players they filled out the high numbers with but they are obviously not in the set. So what happened? Well, darned if I can figure it out but I think it eliminates the possibility of the three missing players being from the hometown NYC teams. One other non-NY possibility is someone from the White Sox as there are none at all in the high numbers I 'll take a closer look at some other possibilities next time. I have posted sporadically on the 1949 Topps Golden Coins and various permutations thereof but while getting into some deep research on the Shorin family I found an intriguing reference to an obscure board game that has a connection to Topps and this set, one of the first issued by Topps, albeit in conjunction with It Happened To A President. 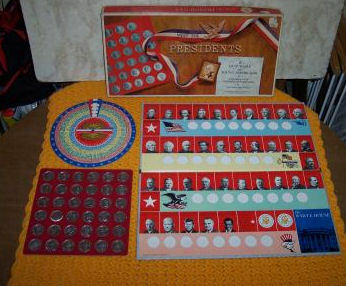 The 1953 Catalog of Copyright Entries lists two entries for Joseph Shorin, the President of Topps at the time, for Meet The Presidents, which turned out to be a Selchow & Righter game (think Scrabble, Trivial Pursuit) that, much to my delight turned out to feature a set of presidential coins as integral pieces. 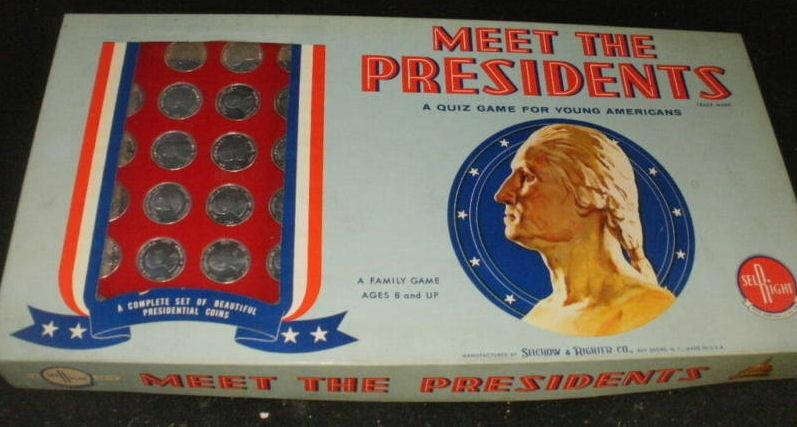 In addition to Joseph Shorin, who was listed individually, Marion E. Stringer also held a copyright (along with Joseph) and Selchow & Righter for the game rules. It would appear that the individual entry for Mr. Shorin was for the coins used in the game, which are based upon the Golden Coins. 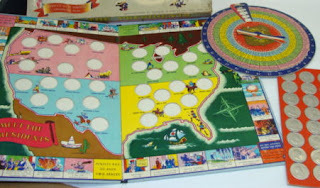 Ms. Stringer apparently liked to design board games, as she was involved with another game called Assembly Line. 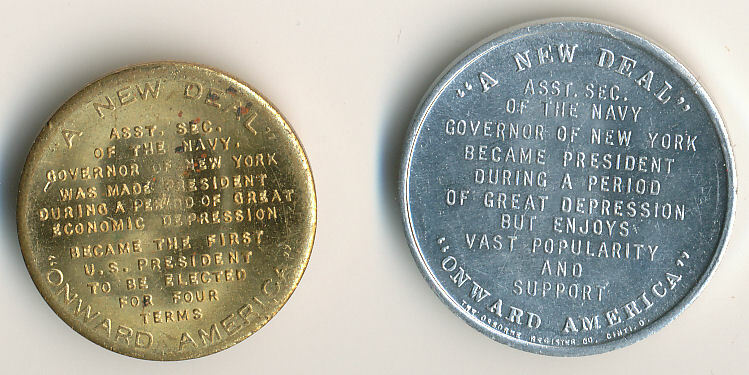 Here are the two side-by-side, the game piece on the left (made of aluminum) and a Golden Coin on the right (made of brass) that was probably a gas station premium. 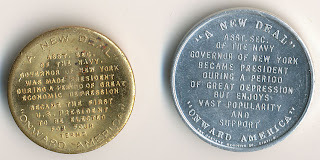 The metal Golden Coin measure exactly 1" in diameter, while the aluminum game piece is larger at 1 3/32". 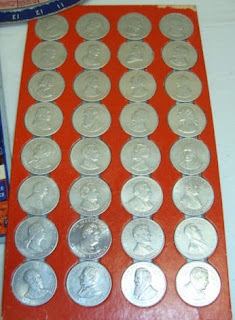 This would seem to mimic the original plastic coins, described as 1 1/8" in diameter. The arc of the coin design from plastic gum insert to metalized component of something larger sold off a shelf follows that of Play Coins of The World, also an original 1949 Topps issue. We get a clue as well from the game coin: It was produced by The Osborne Register Co. of Cincinnati, a firm that was founded in 1835 and exists to this day as a private mint (very handy for a company like Topps). 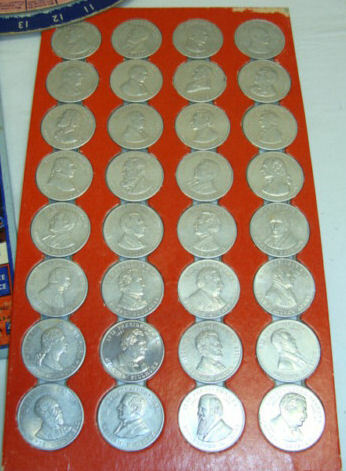 I would think Osborne was involved in producing the metal Play Coins and the Lucky Penny Bazooka premiums from 1957-58 at a minimum. gave us redesigned covers (and game boards) and also 35 and 36 coins respectively. 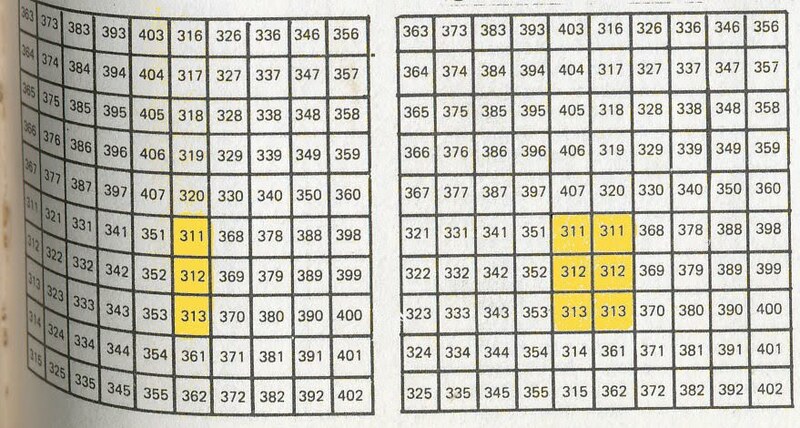 I have to think there was a game with 34 pieces in there too. These are a neat little piece of Topps history! a very popular set that deserves a lot more attention here someday but given this fabulous site, that may not be necessary. 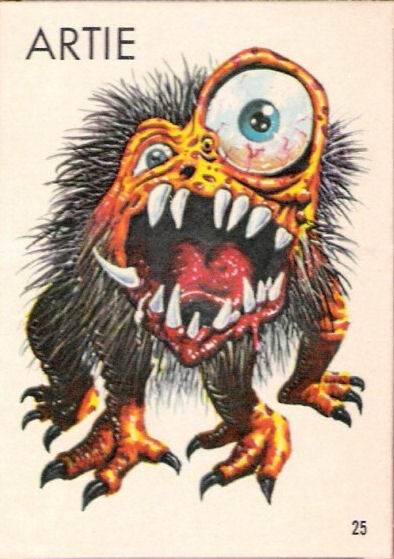 Basil Wolverton, the erstwhile MAD magazine artist and all around tortured genius, came up with a number of the designs for the Ugly Stickers and his style is felt throughout. The great Wally Wood was also involved in addition to Norm Saunders and a mysterious west coast finishing artist. Draconian business practices by Topps appear to have influeneced events as well (starving artists, indeed) with all things Ugly. 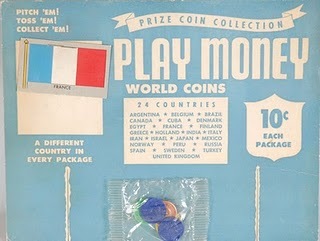 The US version never really seems to have been publicized, sadly, but a 1967 test seems to have morphed into a vending issue-designed to be sold in gumball machines via in those little plastic capsules we all remember. 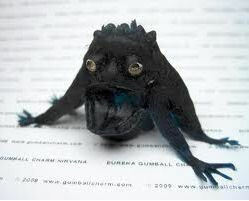 A number of the creatures were later blister-packed and sold as Teacher's Pets in the early to mid 70's. If you click here you can see what looks to be a complete set. These are really cool! I am trying to track down a scan of one of the Ugly Flicker Rings, which has to be a rare bird. As predicted here, there and elsewhere, the total of 198 brings finality with 14 Team Captains known with a single lineup, 40 with two, 24 with three and 8 with four. 86 players are in the set and with the four pose variations there are 90 poses in all. 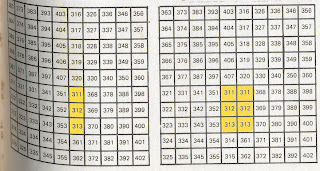 As Larry states, 66 groups of three smooths out the math as lineups are particular to the groups of players in each triad (the connected panels as sold in the ten cent "long" packs). Amidst all this carefully executed perfection though lurks the single lineup question. Namely, if you eliminate the four 66'ers (players who changed leagues and were pulled after only captaining one lineup) there are still ten single lineup players. Eight of these would likely have been replaced by turning a three lineup player into a four lineup-er and I suspect two captains went from two to three lineups as replacements were filled in a second print run as the skewing from 1 through 4 is extreme even for Topps. In a perfect world, the distribution of captains would probably have been with either 2 or 3 lineups. The interaction of pulled players' lineups must have impacted this though, as it seems there would have been 44 two lineup captains and 22 three lineup captains if everything had gone according to plan (if two players went from 2 to 3 lineups the count of those would have been 22). 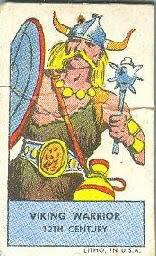 In a set where rules of three rule, that makes (almost) perfect sense. Here's shot of Luis Aparicio, one of the four lineup players, Captain of Captains! I have written here a couple of times now on the incomplete checklist for the smallest of the Hocus Focus issues but there are at least two other early Topps sets where the checklists are not entirely confirmed. One of them I have written about extensively here, the 1949-ish Play Coins of the World, where the issue is not of identifying subjects but colors. 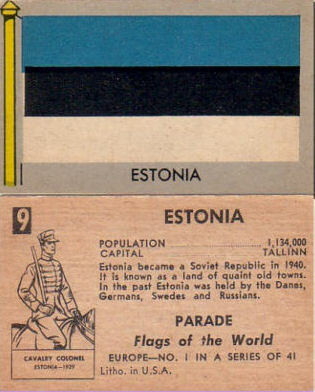 That little enigma is about to get even thornier (stay tuned) but today I want to look at the 1949 Flags of All Nations/Soldiers of the World set and its six missing cards. 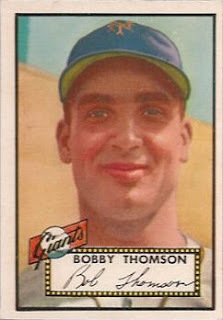 There should be 100 cards in this set, which resembles the other 1949 small Topps cards in size and execution, measuring 7/8" x 1 7/16". These two sided, unnumbered cards feature a flag and attendant pole, mostly of various countries but also featuring flags of the US Marine Corps, the Confederacy and the like printed on a very strange, textured silver surface. The flip side is color painting of a representative citizen of that country or organization. 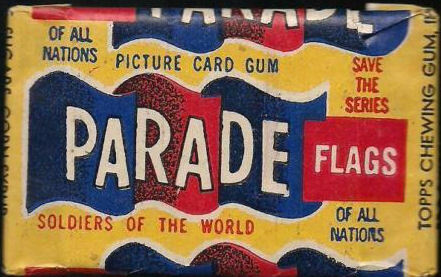 Like the other harder to find small card issues such as Varsity and License Plates, those issued only in penny packs and not via the additional avenues of vending and mail-in offers are difficult to find today. 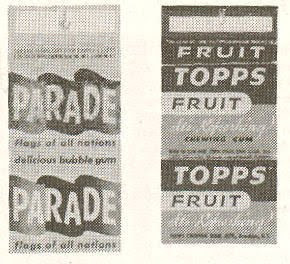 The Parade wrapper would have been primarily yellow with accent colors but I have no idea what color the Fruit gum wrapper was (I would guess pinkish or yellow though) and the above example from the 2nd Edition of the Sport Americana Price Guide to the Non-Sports Cards, 1930-1960 by Chris Benjamin is the only one I have ever seen. The six countries yet to be found from 1949, in case you are asterisk-challenged, are: Admiral's Flag from the US, The Alamo and flags from Gold Coast, Nicaragua, Peru and Yemen. I'll bet they exist and will post scans if and when I find 'em.